Jackson R. Massey & Associates P. C.
The firm of Jackson R. Massey & Associates P.C. has been serving auto injury victims throughout the state of Georgia for many years. 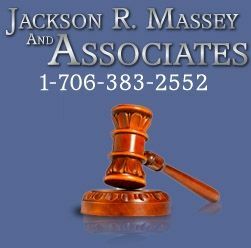 Attorney Jackson R. Massey has helped literally thousands of car accident victims in the state and works diligently in his efforts to help his clients obtain the full amount of compensation in which they deserve. If you or a loved one have been injured in an accident, call the firm for a free case analysis.